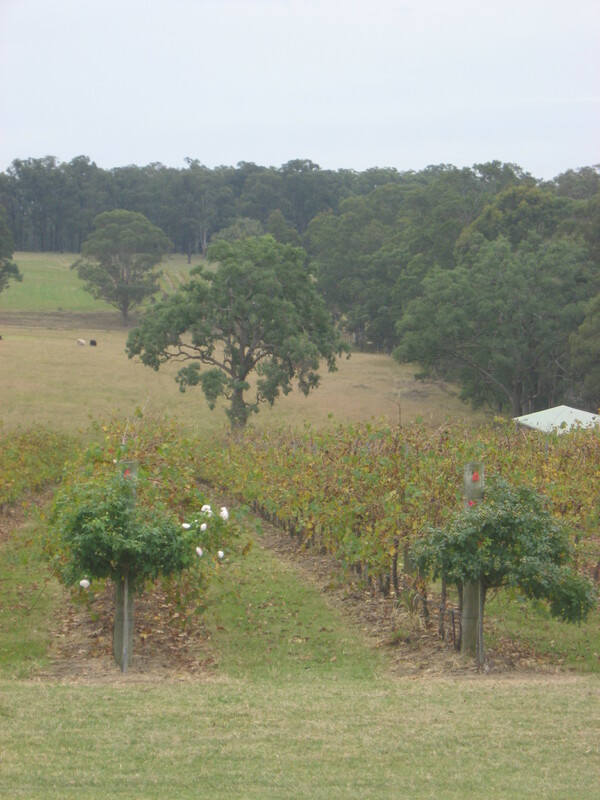 For our third day Down Under, I scheduled a boutique wine tour in the Hunter Valley, about 2 to 3 hours outside Sydney. We were awake, showered and ready, with coffee, before 7:30 am, which had seemed unlikely the night before. But when Rowan The Driver/Guide showed up, we clambered into a comfortable, air-conditioned van. The only other people in the van were an older Indian couple, the Gopols, who would provide tense entertainment for the rest of the day. We sat in the front row. I’m an over-eager teacher’s pet that way. Besides, Graham had never been wine tasting, much less on a day-long tour, so I wanted to make sure we could hear whatever Rowan said. I had an ulterior motive, in addition to being a big fan of boutique wineries and chauffered tours: Graham’s palate needs sophisticating. He likes wine, but he’s the first to admit that he has no particular taste for it. I’m not saying he needs to go all wine-snobby or anything. There isn’t much pleasure in taking a sip, spitting it out, and exclaiming, “This is such swill.” But there’s a great deal of pleasure in paying attention to how the taste of a vintage wine changes in just half an hour after you open it. The view of the vines. The stairway seems out of place, but it could be a lovely area for a wedding. Wine. It’s like magic, isn’t it? I mean, sure…there’s science to it. But there’s also art, and chance. It’s one of the only ways we bottle potential. I love the rose bushes at the end of the rows. I can't remember if this is common in the States...but it ought to be. Anyway, it was a dreary day. And our companions were…interesting. In addition to the Gopols, we met the Tings, who were quite friendly. There was a younger Asian couple whose names I didn’t catch, and one young Korean woman who’d been living in Sydney for six months. In her last week in Australia, she decided to do a wine tour. I liked her — she took notes! — but she was very, very quiet. In fact, most people were. Everyone kept to themselves, and only three of us tasted wines at all three wineries. Iron Gate's stainless tanks for white wine. Two women, Mrs. Gopol and the female half of the young Asian couple (one couple was from Hong Kong and the other was from Singapore, and I’ve forgotten which), didn’t drink at all, and pretty much everyone else refused to taste at the third winery. I thought that was odd. I’ve been on longer tasting tours and sure, by the fifth or sixth winery, you start to feel that maybe it’s time to stop. But this was three wineries, and a stop for lunch. 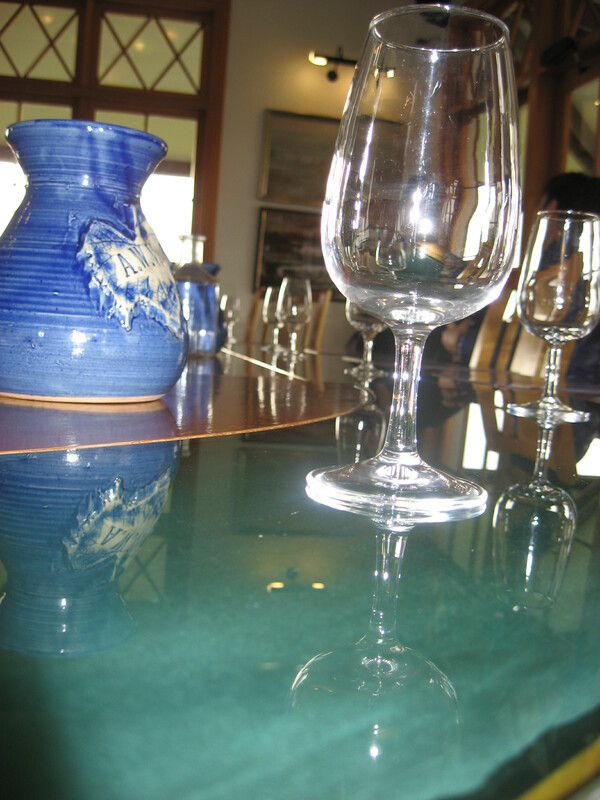 And it wasn’t an expensive tour…but why pay for one at all if you don’t really want to taste the wines? I was sad for the wine. The fields at Audrey Wilkinson, winery #2. Audrey Wilkinson was a fun stop. The server was a riot as well as knowledgeable about the wine. The view from the tasting table. Gallahs! Gorgeous pink and grey birds that deserved a camera with a better lens. We stopped in a little village for lunch. Graham and I wandered off by ourselves — once we’d gotten a feel for the group, I was kind of glad we opted to do lunch on our own instead of buying the lunch that came with a pricier package. Every woman needs a photo of her partner looking pensive, no? The waitress asked if I was ordering the stew to share. I wasn’t. I should’ve, though. It was delicious, but the mashed potatoes underneath made it more like an upside-down shepherd’s pie. The stew that killed me. Almost. After lunch, we took a walk over to Brokenwood, which I’m told makes a fabulous Chardonnay. We didn’t have time for more tasting, though, so it was just a walk, with pictures. Someday, I will go wine tasting before or during harvest instead of when the vines are bare. Seriously, it’s like a thing with me. After lunch, Rowan detoured us down to The Stinky Cheese Shop, which I think he did for my benefit. He’d recommended it (by this time, he’d realized I was a teacher’s pet and liked to talk about food and wine…and I was the only one), but we hadn’t had time to walk there. I was a little grouchy at that point and didn’t want any stinkin’ cheese. But I bought a chunk of delicious goat cheese and proceeded to snarf it down over the next two or three days. Oddly, I got several pictures of the winery where we didn’t taste and no pictures of the third winery on our tour: Ernest Hill. You’ll have to trust me that it wasn’t that impressive, though. The wines were tasty and we bought two bottles there (five, altogether), but it wasn’t much to look at and the rain started in earnest (!) just then. I asked about corks and learned a little more about why Australia’s so pro-screw-top (which is fine by me). The five bottles were a Verdelho for Graham’s folks, a Shiraz-Cabernet that’s been put in a box to age at least five more years, a Shiraz to drink while there, a Merlot that was tasty but won’t age well for more than three years, and, believe it or not, a 375 ml bottle of sweet red Shiraz. I know. Just shut up. It’s tasty. When we girls went tasting in Charlottesville, I bought a Rose, of all things — totally unlike me, but I will not be constrained by the usual preferences of my palate! On the ride home, Rowan put on Bottleshock and drove us back to Sydney through the rain. And now I can’t remember — dinner at the pub may have been this night and not the night before. In fact, it probably was. Iron Gate Winery is my favourite Hunter Valley winery by far. I’m a big fan of the Unwooded Chardonnay. Really great stuff. My parents took a case back to the States with them when they visited. The Unwooded Chardonnay was definitely tasty!